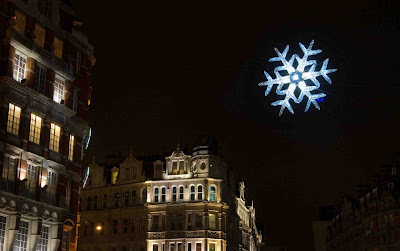 A very exotic swarovski crystal snowflake suspended between Harvey Nicols and the Mandarin Oriental Hyde Park Hotel lights up Knightsbridge. I overheard a couple of chaps discussing the cost of it the other day. £250,000 was the number they mentioned. This truly stunning snowflake is 5 meters. Designed by Ingo Maurer. It will dangle in all its glory until 5 January. Harrods and Harvey Nicks are selling an ornament version made from solid crystal with a percentage of the proceeds going to charity. Yesterday Marley passed the Butterfly award to me. Thanks I am honoured. 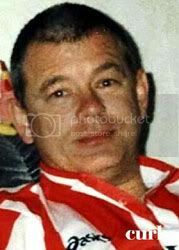 Pay a visit to his great blog. Merry Xmas to you all. I am today on a plane to take a few days break. Great shot. Have a Merry Christmas. Although I have not been able to get around the City Daily Photo Blogs as much as I would have liked these past few months, especially since the last heart attack, I'd like to drop in at this time to wish you and your family the very best wishes for Christmas. From Curly at South Shields Daily Photo. This is beautiful and your photo of it is just perfect. I'm stuck on the cost. In US dollars that's about half a million. This is a lot of money for a holiday decoration! Wow! a very nice shot. Merry Christmas everyone. Enjoy your break and have a terrific Christmas. lovely picture. have a merry christmas!